Before hiring the firm, you must understand why do you need an expert or a company to run your online advertising campaigns. Though companies doing digital marketing have increased from the 10% of last year to 14%, most of them have failed to track their returns from these campaigns due to lack of skills. Having said that, the average person spends more time online than engaging in other offline activities like watching TV, reading newspaper, talking with others (yes, a reality check!) and so on. According to MediaPost, the internet will become the largest medium for branding in coming years. Owing to all these reasons, ignorance of the potential of Digital Marketing can cost you losing your potential online customers. How to decide before hiring anyone? Once you have decided that you want to work with a digital marketing agency, the question arises, “Which agency to choose?” While a simple Google search may give you a list of such agencies both in India and abroad, you may benefit immensely by following the checklist below which will help you in understanding whether or not the agency you select is the right partner for you. More importantly, you will be able to maximize your ROI, increase visibility and drive engagement. Not all forms of content and social media platforms are suitable for every type of business. For example, if you are a B2B company, what is more, likely to benefit you more? A presence on LinkedIn, or on Facebook? Similarly, if you are a photographer, which one is better suited to your needs – Instagram or Twitter? The right digital agency should & will work hard to understand you and your customers. So after understanding your business, a digital marketing firm can decide which type of marketing strategy and which kind of social media platform suits your business. Because this understanding will aid them in developing an insightful strategy. Digital Marketing can be done for different purposes. You need to be clear in your mind about the reason you want to advertise your business online. It can be for creating awareness, increase downloads, getting more people to signup for your service or maybe to purchase the products that you sell. Are you looking for increased social media following? Are you trying to increase traffic to your website? How much time will you have to invest in the campaign? If you have to do the majority of the heavy lifting, then why hire an agency at all? 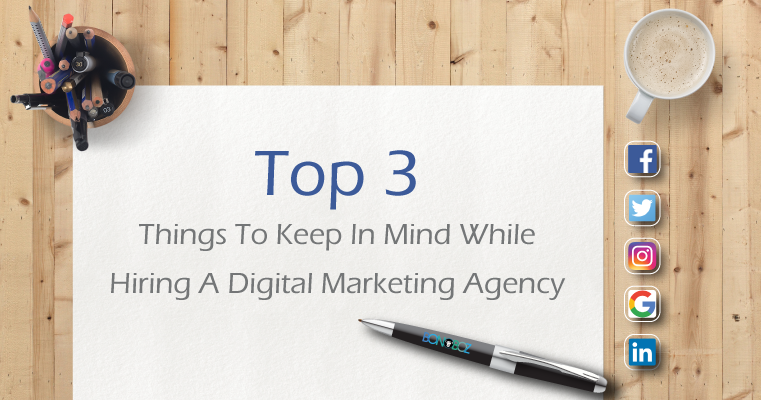 Similarly, stay away from an agency which promises quick results, such as increased traffic or sales. In the market, it often happens that companies brag too much about their services but fail to prove their words after assigning the project. Since the after sales service is all you need to increase your reputation, you must research about how they respond after assigning of the project. Discussing these aspects, about follow-ups/reporting, before hiring anyone is highly recommended. Will the agency send a report at the end of the engagement that has so much data that it will confuse you? Or will they send periodic updates to help you understand whether the campaigns are delivering the results or not? For example, data which shows whether the cost per click for Google AdWords reduced over a period, or has the engagement on Twitter increased? Likewise, are you able to reach the targeted customers through Facebook ad campaign? If you know that you are going off course, you will have an opportunity to correct the course. Last but not the least, you need to understand that the results will take time. It could be as little as a few weeks or may even take a few months. Digital marketing is a medium of long-term play. Simply put, you will reap the benefits of the seeds you sow when the time is right. Also Read – 6 benefits of outsourcing your digital marketing that you did not know about!